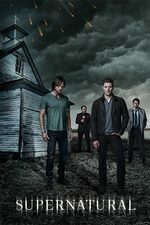 Dean continues to struggle; Sam must think fast when action figures come to life, and the heroes find themselves living in a real-life horror movie. - Female!Sam: "Where did you learn how to do that?" Sam: "I had a really messed up childhood." - I enjoyed seeing Dean nerding out with the other guy from the shop. - We finally learn why Sam really hates Halloween, which is a callback that goes all the way back to the pilot of the series. - In the Supernatural universe, it seems like there is a very high percentage of cremations. - If my house/bunker had been invaded by a bunch of random people, I too would be hiding out in my room, so I sympathize with Dean on this one. Why did they not clean up the morgue after that fight? I guess nobody wanted to touch the recently haunted life-size figure of Hatchet Man? I enjoyed this one, a classic Supernatural episode, right down to last minute ghost object burning. This one was a lot of fun, touching on all kinds of stuff we don't see on this show much anymore. In a lot of ways it felt like an episode from the 'aughts, but in a good way. The comic book store people were instantly endearing, and I kind of hope we see them again. (Dean seemed to have found a real soulmate in the little nerd guy.) You could tell they had an absolute blast making those excerpts from the cheesy old slasher movie, and the part where the security guys were watching the old movie while pretty much the exact same scene was playing out for real nearby, that was really clever. I was a little surprised the Thundercats people signed off on making Panthro evil, though! My one quibble was that the guy from the comic book store did seem to buy Dean's explanation about ghosts being real a little too easily, without any evidence IIRC. But all in all it was great fun, and I think it served as a palate cleanser for the audience in the same way it did for Dean. It reminded us of how much goofy fun this show can be. It made me extra glad to have Dean back, because there's really no way it would have worked with Sam on his own. Too bad it aired the day after Halloween, because it was obviously meant to be a Halloween episode and it was a corker! I never know how many episodes like this they have left in the tank, but I’m super super happy every time one shows up. Props to whoever put that Red Hood costume behind Jensen Ackles in the first comic store scene, it looks like it cost three dollars and would be exactly what Jason Todd would proudly wear. The comic store kids were delightful and I’m shocked Dean never got the payoff to Sam’s comic store soulmate actually being named Sam. The apple barf incident was a pretty funny story, although I actually think it’s much funnier that Sam is coming up on forty years old and it still bothers him so much that he doesn’t even like to see other people enjoying Halloween. I actually was pretty sure he was hedging at the beginning because Halloween 2005 was when Dean came to get him at Stanford and he very quickly went from being future lawyer/future Mr. Jessica Moore to being neither of those things, and even if he’s pretty okay now with how his life turned out, if he kind of didn’t have great associations with Halloween before he had several other MUCH WORSE ones after. But the apple barf story’s good too, it’s cool, I’d block out a bunch of season one too if I could. I also dig that while Dean can be great with people, he can also be quite shy, and having a bunch of strangers in his space is really intensely not his thing (and I mean, fair enough.) Sam can stay touchy about a high school party for twenty years but he can also handle a lot of that people-management stuff and just bring Dean weird Panthro-attack cases to cheer him up and get him out of the house once in a while, and everybody’s happy. Yeah that was a great nod to him voicing the Red Hood for that one movie, and then he also dressed up as Red Hood for halloween! Eh, I'm not a fan of monster of the week episodes. I'm also not a fan of the way everything else that was going on gets ignored so they can happen. Last week Jack was coughing up blood but this week we're supposed to forget all about that. I'm not that interested in seeing Sam and Dean joke around and fight random monsters over and over again. I want something new and interesting to happen, something that I couldn't have predicted, something that will make me want to find out what happens next. But it looks like I'm in the minority. Yeah, I guess this one was fun, but I hope they get back to what I think of as the real story soon. I actually really enjoyed this one. I liked how Dean's so-called twin made you think "Uh, not so..." and then later they bond over that crappy movie. I like how Dean likes horror movies because he knows the good guy wins. I did think Sam's reason for hating Halloween seemed a little weird (uh, that ruined Halloween for all time? ), but good point here that that's around when the show started. Best "monster of the week" episode in a very long time. The writers (and JA/JP) clearly had fun with this. We needed a breather from the sturm und drang big plot.